So, you found the perfect pair of jeans online, and you've even found the size chart, but you still don't have a clue what size to order because you're not sure how to get the correct measurements. Sound familiar? Don't worry, it's easier than you think, especially if you already own a pair of jeans that fits you perfectly. If not, it helps to have a friend to help with the measurements and you need a good cloth measuring tape. It's not hard to do and once you have your measurements you can shop for the perfect pair of jeans online with ease. Of course, some sites will give you specific directions on how to measure for their jeans, always follow those directions if given. For most people the waist measurement is the most confusing since most jeans are now low rise and therefore don't come anywhere near your natural waist. For most jeans the sizing is still based on your waist measurement, unless stated otherwise. When in doubt, I use the hip measurement, since at this time it is the most relevant. The first three measurements are the most common, the waist, hips and inseam, but sometimes a thigh measurement is also needed. Waist: Measure around the smallest portion of your waist. Although it's higher than you're going to wear your jeans, this is the figure that determines most waist measurements. So, be careful not to hold the measuring tape lower, or you may end up with loose-waisted jeans. If your measuring existing jeans, lay them flat and measure the waist from side to side and then double that figure. Hips: Measure around the widest portion of your hips. This is usually just below the top of your hip bones. If your measuring existing jeans just lay them flat and measure at the widest point of the jeans and double that measurement. Inseam length: Measure the inside of your leg from your crotch to the floor wearing the shoes you will wear with the jeans. 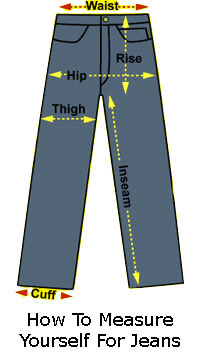 If you have an existing pair of jeans lay them flat and measure them from the crotch seam to the bottom of the jeans. Thigh width: Wrap the measuring tape around the widest portion of one of your thighs. Again, if you have existing jeans, just lay them flat and measure the widest portion of the thigh and double it. 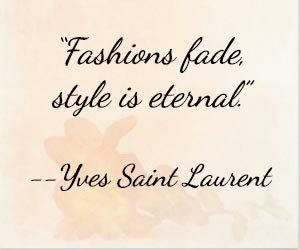 When it comes to actually buying your jeans, it's always a good idea to add one inch to each of the measurements offered on jean sites..
JeansHub.com offers sizing charts for most of the major brands of jeans. If you need to convert international sizes, please see International Jeans Size Conversions. If your a man wanting to know what size you would be in ladies jeans, please see Mens to Womens Jeans Sizing Charts.